Looking up through the signature space of the rotunda of the Guggenheim Museum. John Chamberlain: Choices offers a comprehensive examination of the work of the late John Chamberlain and the first U.S. retrospective since 1986. Comprising approximately one hundred works, the exhibition examines the artist’s development over a sixty-year career, exploring the shifts in scale, materials, and techniques informed by the assemblage process that was central to his working method. The exhibition presents works from Chamberlain’s earliest monochromatic iron sculptures and experiments in foam, Plexiglas, and paper, to his final large-scale foil pieces, which have never been shown in the United States. Chamberlain was first celebrated at the Guggenheim in a 1971 retrospective. John Chamberlain: Choices is organized by Susan Davidson, Senior Curator, Collections and Exhibitions, and is accompanied by a fully illustrated exhibition catalogue. This exhibition is supported by the Henry Luce Foundation and the Terra Foundation for American Art. The Leadership Committee for John Chamberlain: Choices, chaired by Larry Gagosian, is gratefully acknowledged. The Deutsche Bank Series at the Guggenheim: Being Singular Plural presents new film, video, and sound-based works by seven of the most innovative and visionary artists, filmmakers, and media practitioners living and working in India today. Expanding on its original 2010 Deutsche Guggenheim presentation, the exhibition presents eight projects dispersed among the museum’s Annex galleries, New Media Theater, and outdoors along the exterior of the building, from Fifth Avenue down to the Sackler Center for Arts Education. Being Singular Plural includes works by Desire Machine Collective (Sonal Jain and Mriganka Madhukaillya), Shumona Goel and Shai Heredia, Amar Kanwar, and Kabir Mohanty and Vikram Joglekar. The exhibition is part of the Guggenheim’s Asian Art Program and is organized by Sandhini Poddar, Associate Curator, Asian Art. Accompanied by a fully illustrated exhibition catalogue and series of public programs, this exhibition is made possible by Deutsche Bank. The Leadership Committee for Being Singular Plural is gratefully acknowledged. Francesca Woodman is the most comprehensive U.S. exhibition of the artist’s work since her untimely death in 1981 at the age of 22. Woodman's oeuvre represents a remarkably rich and singular exploration of the human body in space and of the genre of self-portraiture in particular. Spanning the breadth of her production, the exhibition includes more than 120 vintage photographs, two artist books, and a selection of six recently discovered and rarely seen short videos, presenting an historical reconsideration of Woodman’s brief but extraordinary career. Francesca Woodman is organized by the San Francisco Museum of Modern Art (SFMOMA). The exhibition has been curated by Corey Keller, Associate Curator of Photography, SFMOMA, where it opened in November 2011. The New York presentation of Francesca Woodman is organized by Jennifer Blessing, Senior Curator, Photography, Solomon R. Guggenheim Museum. This exhibition is supported by the Leadership Committee for the Guggenheim Museum's 2012 Photography Exhibitions. The third edition of stillspotting nyc, a two-year multidisciplinary project that takes the Guggenheim Museum’s programming out into the streets of New York’s boroughs, will be presented in Jackson Heights, Queens. For this project, Transhistoria, the architects at Solid Objectives – Idenburg Liu (SO – IL) wonder how one finds peace and calm in such a bustling environment as Jackson Heights. The exhibition examines transformative personal narratives through a series of stories commissioned from Queens-based writers. During four weekends in April and May, residents will recount these stories around neighborhood “stillspots” as varied as residential living rooms, performance venues, and private gardens. In two-hour, self-guided tours beginning at the Jackson Heights-Roosevelt Ave transit station, visitors will encounter four personal “transhistories,” stories of migration, displacement, and finding familiarity and identity in a new place. Stillspotting nyc is organized by David van der Leer, Assistant Curator, Architecture and Urban Studies, with Sarah Malaika, Stillspotting Project Associate. Support for stillspotting nyc is provided by the Rockefeller Foundation NYC Opportunities Fund and a MetLife Foundation Museum and Community Connections grant. This project is also supported in part by the National Endowment for the Arts. The Leadership Committee for stillspotting nyc is gratefully acknowledged. Learning Through Art (LTA), the pioneering arts education program of the Guggenheim Museum, presents A Year with Children 2012, an exhibition that showcases selected artworks by New York public school students in 2nd through 6th grade. These students participated in a yearlong artist residency program that partners professional teaching artists with classroom teachers in each of the city’s five boroughs to design collaborative projects that explore art and ideas related to the classroom curriculum. Approximately 100 creative and imaginative works will be on display during this five-week installation, including drawings, prints, photographs, sculptures, paintings, and assemblage pieces. For a complete list of funders, visit guggenheim.org/lta. The BMW Guggenheim Lab is a mobile laboratory traveling to nine major cities worldwide over six years. Led by international, interdisciplinary teams of emerging talents in the areas of urbanism, architecture, art, design, science, technology, education, and sustainability, the Lab addresses issues of contemporary urban life through programs and public discourse. The BMW Guggenheim Lab Berlin, the Lab’s second stop on its nine-city tour, will be housed in the innovative mobile structure designed by Tokyo-based architects Atelier Bow-Wow and will offer a range of free programs exploring issues confronting urban life. The BMW Guggenheim Lab Berlin is created by Guggenheim curator Maria Nicanor with the Berlin Lab Team, which includes José Gómez-Márquez, program director for the Innovations in International Health Initiative at MIT, Boston; Italian architect and engineer Carlo Ratti, who directs the SENSEable City Lab at MIT, Boston; Berlin-based artist Corinne Rose; and Rachel Smith, principal transport planner with AECOM, based in Brisbane, Australia. The BMW Guggenheim Lab initiative is organized by David van der Leer, Assistant Curator, Architecture and Urban Studies, and Maria Nicanor, Assistant Curator, Architecture. The BMW Guggenheim Lab is a collaboration between the Solomon R. Guggenheim Museum and Foundation and the BMW Group. For more information, visit bmwguggenheimlab.org. This exhibition explores contemporary trends in abstraction in the decade before the Guggenheim's iconic Frank Lloyd Wright–designed building opened in 1959. Alternately embracing artistic freedom and gesture-based styles, nontraditional materials and counter-cultural references, artists in the post–World War II era pioneered such influential developments as Abstract Expressionism, Art Brut, Cobra, and Art Informel. Art of Another Kind: International Abstraction and the Guggenheim, 1949–1960 especially highlights works that entered the Guggenheim collection during the tenure of the museum's second director, James Johnson Sweeney, from 1952 to 1960. Through nearly 100 works by Louise Bourgeois, Alberto Burri, Asger Jorn, Willem de Kooning, Jackson Pollock, Pierre Soulages, Antoni Tàpies, and Zao Wou-Ki, among others, this collection-based exhibition explores the affinities and differences between artists working continents apart in a period of great transition and rapid creative development. The exhibition is organized by Tracey Bashkoff, Curator, Collections and Exhibitions, and Megan Fontanella, Assistant Curator, Collections and Provenance. Rineke Dijkstra: A Retrospective is the first U.S. midcareer survey of this important Dutch artist's work in photography and video. This comprehensive retrospective features Dijkstra's celebrated Beach Portraits and other early works such as the photographs of new mothers and bullfighters, together with selections from her later work, including her most recent video installations. Rineke Dijkstra: A Retrospective is curated by Jennifer Blessing, Senior Curator, Photography, Solomon R. Guggenheim Museum, and Sandra S. Phillips, Senior Curator, Photography, San Francisco Museum of Modern Art. The exhibition is accompanied by the most comprehensive monograph on the artist's work to date. Rineke Dijkstra: A Retrospective is supported by the Mondriaan Foundation, Amsterdam. The New York presentation is supported in part by the William Talbott Hillman Foundation and The Robert Mapplethorpe Foundation. This exhibition is supported by the Leadership Committee for the Guggenheim Museum's 2012 Photography Exhibitions. Few artists have exerted as considerable an influence over subsequent generations as Pablo Picasso, who is renowned for a great variety of styles, techniques, and ideas. Picasso Black and White is the first exhibition in a major museum setting to explore Picasso’s use of the recurrent motif of black and white across his oeuvre. Organized chronologically, the exhibition explores the breadth of Picasso’s lengthy career, tracing how a deceptively simple palette pervaded his rose and blue periods, investigations into Cubism, neo-classical and Surrealist-inspired figure paintings, homage to old masters canvases, novel interpretations of historical subjects, and the highly charged works of his twilight years. Comprising 110 paintings and sculptures and a selection of works on paper, the exhibition is drawn from museums across Europe and the United States, as well as private collections, including those of the Picasso family. Picasso Black and White is organized by Carmen Gimenez, Stephen and Nan Swid Curator of Twentieth Century Art. This exhibition is supported in part by the National Endowment for the Arts. Additional support is provided by the Blanche and Irving Laurie Foundation and the Juliet Lea Hillman Simonds Foundation. The Leadership Committee for Picasso Black and White is gratefully acknowledged. As part of the Guggenheim’s Panza Collection Initiative, a comprehensive evaluation of Minimalist, Post-Minimalist, and conceptual works from the 1960s through the 1970s in the museum’s Panza Collection, this exhibition investigates conservation issues surrounding the presentation and preservation of the art of Dan Flavin. During the early 1960s, Flavin worked solely with industrial mediums, mainly fluorescent lamps and fixtures, and delegated the fabrication of his works to assistants and others. This practice has raised difficult questions for curators and conservators: If materials degrade, what are the posthumous parameters for remaking a work? Is an older, historical incarnation of a work more authentic than one that is fabricated today? Flavin's instructions for installing and displaying a given work in a gallery space can be cryptic, leaving further questions both practical and art historical. With respect to the questions addressed in the exhibition, perhaps the most important issue overall concerns the status of the sculptural object in American art after 1960. The exhibition presents seven works from the museum’s Panza collection including Flavin’s greens crossing greens (to Piet Mondrian who lacked green) (1966), which fills an entire gallery, and supporting documents, drawings, and photographs. Dan Flavin is organized by Jeffrey Weiss, Curator, Panza Collection. This exhibition results from the Panza Collection Initiative, supported by The Andrew W. Mellon Foundation. The exhibition Zarina: Paper Like Skin, organized by Allegra Pesenti, Curator, Grunwald Center for the Graphic Arts, Hammer Museum, travels to the Guggenheim Museum as part of an international tour. This retrospective of Indian-born American artist Zarina Hashmi is the first major exploration of the artist’s career, charting a developmental arc from her work in the 1960s to the present and includes many of her seminal works from the late 1960s and early 1970s, woodblock prints, etchings and lithographs, and a small selection of related sculptures in bronze and cast paper. The Guggenheim’s recent acquisition of a major series of twenty of the artist’s pin drawings from 1975 to 1977 will serve as a fulcrum for the New York presentation, which will be conceived in close collaboration with the artist. An exhibition catalogue provides insights into this important artist’s life and work. The Guggenheim presentation is organized by Sandhini Poddar, Associate Curator, Asian Art. 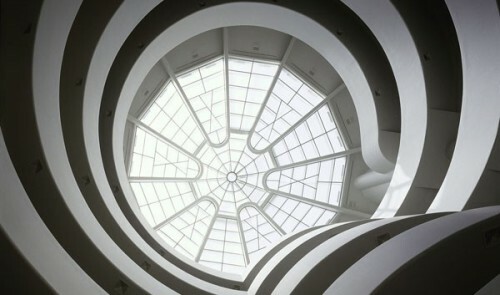 The Guggenheim is organizing North America’s first museum exhibition devoted to Gutai, the most influential artists’ collective and artistic movement in postwar Japan and among the most important international avant-garde movements of the 1950s and 1960s. Organized thematically and chronologically to explore Gutai’s inventive approach to materials, process, and performativity, the exhibition explores the group’s radical experimentation across a range of media and styles and demonstrates how individual artists pushed the limits of what art could be or mean in a postatomic age. The range includes painting, conceptual art, experimental performance and film, indoor and outdoor installation art, sound art, mail art, interactive or “playful” art, light art, and kinetic art. The exhibition comprises some 120 objects by 25 artists on loan from museum and private collections in Japan, the United States, and Europe, and offers new scholarship, especially on so-called “late Gutai” works dating from 1965 to 1972. Gutai: Splendid Playground is organized by Ming Tiampo, Associate Professor of Art History, Carleton University and Alexandra Munroe, Samsung Senior Curator of Asian Art, Solomon R. Guggenheim Museum. The Hugo Boss Prize, a biennial award administered by the Solomon R. Guggenheim Foundation, was founded in 1996 to honor significant achievement in contemporary art. Selected by an international jury of curators, the six finalists for the Hugo Boss Prize 2012 are Trisha Donnelly, Rashid Johnson, Qiu Zhijie, Monika Sosnowska, Danh Vo, and Tris Vonna-Michell. The winner of the ninth prize will be announced in fall 2012 and an exhibition of the artist’s work will be presented at the Guggenheim in spring 2013. Previous winners include Matthew Barney (1996), Douglas Gordon (1998), Marjetica Potrc (2000), Pierre Huyghe (2002), Rirkrit Tiravanija (2004), Tacita Dean (2006), Emily Jacir (2008), and Hans-Peter Feldmann (2010). The Hugo Boss Prize 2012 is organized by Katherine Brinson, Associate Curator. In 1922 Vasily Kandinsky accepted a teaching position at the Bauhaus, the state-sponsored Weimar school of art and applied design founded in 1919 by architect Walter Gropius. The school’s curriculum was based on the principle that the crafts were equal to the traditional arts and was organized according to a medieval-style guild system of training under the tutelage of masters. Geometric shapes came to play a dominant role in Kandinsky’s pictorial vocabulary at the Bauhaus. This was due, in part, to his familiarity with the Suprematist work of Kazimir Malevich and the art of the Constructivists. Kandinsky’s turn toward geometric forms was also likely a testament to the influence of industry and developments in technology. Drawn from the museum’s permanent collection, this intimate presentation features paintings and works on paper from a prolific period of Kandinsky’s career. The exhibition is organized by Tracey Bashkoff, Curator of Collections and Exhibitions. This focused presentation on view in the Sackler Center for Arts Education provides a compelling historical overview of three award series—the Guggenheim Internationals, the Theodoron Awards, and the Exxon Nationals and Internationals—exhibited at the Guggenheim between 1956 and 1987. The participating artists and resulting acquisitions are highlighted, with accompanying photographs, catalogues, audio and video clips, and ephemeral materials that illuminate the institution’s longstanding support of emerging artists. Bequeathed to the museum by art dealer and collector Justin K. Thannhauser, the Thannhauser Collection includes a selection of canvases, works on paper, and sculpture that represents the earliest works in the museum’s collection. The Thannhauser holdings include significant works by Paul Cézanne, Edgar Degas, Paul Gauguin, Édouard Manet, Claude Monet, Pablo Picasso, Camille Pissarro, and Vincent van Gogh. Thannhauser’s commitment to supporting the early careers of such artists as Vasily Kandinsky, Paul Klee, and Franz Marc, and to educating the public about modern art, paralleled the vision of the Guggenheim Foundation’s originator, Solomon R. Guggenheim. Among the works Thannhauser gave are such incomparable masterpieces as Van Gogh’s Mountains at Saint-Rémy (Montagnes à Saint-Rémy, July 1889), Manet’s Before the Mirror (Devant la glace, 1876), and close to 30 paintings and drawings by Picasso, including his seminal works Le Moulin de la Galette (autumn 1900) and Woman Ironing (La Repasseuse, spring 1904). Admission: Adults $18, students/seniors (65+) $15, members and children under 12 free. Admission includes an audio tour of the current exhibition available in English, and highlights of the Guggenheim’s permanent collection, available in English, French, German, Italian, and Spanish.